A parish plans to build Parramatta Diocese's first columbarium, a resting place for urns containing ashes of the dead. Source: Catholic Outlook. 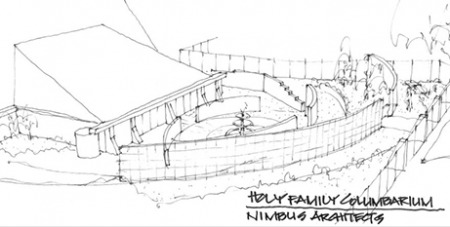 Holy Family Parish in Mount Druitt will build the outdoor columbarium as a way of bringing care for the dead back into the parish and enable cheaper funeral costs for the disadvantaged. “We’ve had the idea for a number of years both as a way of promoting a sense of praying for the dead in the parish and as a way to help out, aimed at this poor area,” parish priest Fr Gregory Jacobs SJ said. A place in this columbarium will cost approximately $2,000-$4,000, which is more affordable than a lawn burial plot, which costs from $6,000 to tens of thousands of dollars in Sydney. Members of the parish have already donated some niches for the remains of the most disadvantaged. “One of the benefits of having your own [columbarium] is being able to help out families in need,” Fr Jacobs said. The columbarium will be part of a natural progression in the Church, from the entrance baptismal font, to the central altar, and then the outside resting place. “It’s a happy coming together of a number of things,” Fr Jacobs said. This consecrated resting place will stand roughly 180cm high in three tiers with a central transept. The parish needs to raise one-third of the construction costs and is seeking to do so through people reserving a place in the columbarium.